Another 7.1 earthquake hits Japan around 10:30pm Malaysian Time (GMT +8) April 7, 2011!!! The location of the 7.1 earthquake that hits Japan on April 7, 2011, 11:32pm (Japan time). Another earthquake has struck Japan while I was clearing my letters and updating my blog. It was measured 7.4 at first and later US Geological Survey (USGS) revised it to 7.1. This is indeed a sad story to be heard. I believe this will become the headline again tomorrow morning in all our major dailies. Japan, what is happening to you actually? After being hit with 7.1 earthquake, Japan’s meteorological agency issued a tsunami warning for northeastern coast of Japan and 90 minutes later lifted its tsunami warning. Phew! God bless them. Luckily there’s no more tsunami. Officials at the tsunami-ravaged Fukushima Dai-ichi nuclear plant said there was no immediate sign of new problems caused by the aftershock. All seven of the workers at Fukushima Daiichi were safe, a spokesman for plant operator Tepco told a news conference in Tokyo. The 7.1 earthquake struck at 2332 local time (1432 GMT) on Thursday, 118km (78 miles) north of Fukushima, 40km offshore. 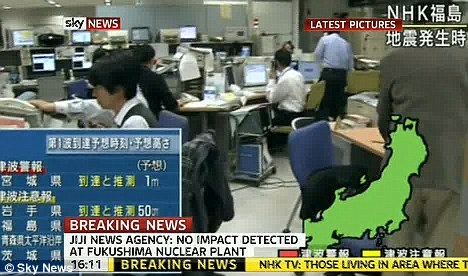 Office workers hanging on their desk as the 7.1 earthquake hits Japan. The tremors of the quake can be felt as far as Tokyo, 265km south of the affected area. Some Tokyo office workers hanging on their desks when the 7.1 earthquake shook them for roughly 1 minute. There have been 1000++ aftershock after the 9.0 earthquake that hits Japan on the fateful March 11, 2011 and not many are stronger than 7.0. Let’s pray for the people in Japan as hundreds of thousands of people left homeless after the tsunami has flattened their homes in the northeastern of Japan. At the mean time, watch some Youtube videos of the 7.1 earthquake. Next story Cute Android Dancing at Taiwan for Sony Ericsson Xperia arc Taiwan Promotion! Previous story Sony Ericsson Xperia Arc is here already & more Android Smartphones & Tablets Coming to Malaysia!